Context - To date, millions of tooth whitening kits have been sold across the world to consumers seeking to brighten their smiles. Tooth whitening products can be applied as paint-on gels, strips, or mouth guards, either at the dentist’s office or at home. The whitening ingredient in these products is hydrogen peroxide. In general, the more hydrogen peroxide, the greater the whitening power. Are toothpastes, mouth-rinses and tooth whitening products containing hydrogen peroxide safe? Should they be freely available to consumers? Hydrogen peroxide is a highly reactive chemical containing hydrogen and oxygen. It is used mainly in the production of other chemicals and to bleach paper and textiles. Moreover, contact lenses can be disinfected with highly diluted hydrogen peroxide. Carbamide peroxide is a chemical that is made of hydrogen peroxide and urea. Tooth whiteners and oral hygiene products – such as certain toothpastes and mouth rinses – use hydrogen peroxide or carbamide peroxide for its whitening and/or disinfecting properties. Peroxide whitens teeth by passing into the tooth and reacting with the molecules that cause stains or discoloration. In general, the more peroxide, the greater the whitening power. Depending on their peroxide content, such products are either freely sold over the counter for home use, dispensed by dentists for home use, or exclusively applied by dentists in their offices. In the European Union, oral hygiene products may only be sold freely to consumers if they contain no more than 0.1% hydrogen peroxide whereas in the USA, whitening products are sold at higher concentrations. In-office bleaching generally uses products with higher levels of whitening agents. Tooth whitening products can be applied at home in three different ways: using strips that are stuck onto teeth, custom made mouthguards that maintain the whitening product on the teeth, or gels that are painted directly on the teeth. 4.2 How much hydrogen peroxide is released into the saliva during tooth whitening treatments depends mostly on the amount of hydrogen peroxide in the product being used and the product type and only partly on the amount of saliva produced. During a tooth whitening treatment procedure, the concentration of hydrogen peroxide on the gums and in the saliva falls rapidly because hydrogen peroxide is broken down quickly. 6.2 Oral hygiene products and tooth whiteners containing hydrogen peroxide are not very likely to affect the body as a whole, because the substance is rapidly broken down. But above certain levels effects have been seen in animals. In addition, there are concerns about direct effects like irritation in the mouth and in the gastrointestinal system after swallowing. In the European Union, oral hygiene products may only be sold freely to consumers if they contain no more than 0.1% hydrogen peroxide. Above 0.1% hydrogen peroxide, tooth bleaching is not just a simple cosmetic procedure. Dentists should diagnose the cause of the staining, check whether patients have any other oral health problems, and counsel patients about the best way of dealing with this esthetical problem. As already mentioned above, common undesirable side effects of tooth whitening treatment, such as increased tooth sensitivity and mouth irritation, usually disappear within a few days. The surface of fillings and other restorations can be affected. The use of toothpastes, mouth rinses and tooth whiteners containing up to 0.1% hydrogen peroxide does not pose a risk to the health of the consumer. Toothpastes and mouth rinses should not contain more than 0.1% hydrogen peroxide. The use tooth whitening products containing 0.1 to 6 % hydrogen peroxide entails potential risks for the consumer. These risks increase with increasing concentration of hydrogen peroxide and frequency of application. Potential risks of the use of tooth whiteners containing between 0.1 and 6 % hydrogen peroxide can be limited if tooth whitening is done properly with the approval and under the supervision of a dentist. The specific situation of each individual should be taken into account prior to treatment. Additional research is needed on the use of tooth whitening products over longer time periods. 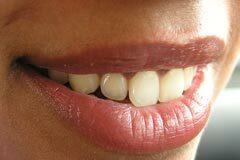 Use of tooth whitening products containing more than 6% is not considered safe for use by consumers.